Nobody ever really thinks about it, tap water. They wake up in the morning, turn on the tap and fill a glass with cold refreshing water. As cold and refreshing it is, I guarantee most of us that our tap water is not actually that fresh. It’s sent through all kinds of stuff before it reaches your glass from chemicals to filters and pipes that have been there for how long, there is definitely build up and depending on where you live you can probably taste it. We live in the city and in an older house with old pipes and water that the kids say “tastes like feet” and I agree with them it kind of does taste off. We usually just put water in the fridge and it tastes better when chilled. Some fridges are built in with water systems but ours isn't so, tap water or boil it! I know they’ve been on the market for years, my mom had one at one point (I think she still does?) but I never actually thought about investing in a water filter system to put in the fridge considering we live right in the city (forget the old pipes I mentioned?). 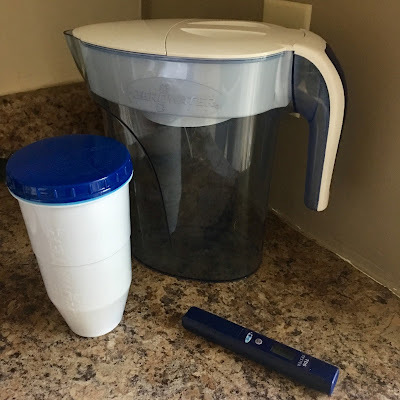 We were sent over a ZeroWater filter system to try out with the family, it even comes with a tester to prove how off your water could really be compared to the clean, fresh taste of filtered water. Super easy to set up, you screw the filter onto the bottom of the container lid and pop it on top. Fill the reservoir with water and let it filter through. Voila, clean - fresh water. The only thing I found kind of annoying is that you have to fill the top part a few times for it to filter through and fill the entire water container but after that, just remember to fill it after every few glasses and you’ll almost always have fresh water. It's nice to see the family drinking more of it! Learn more about the benefits of ZeroWater by visiting the website! We want you to wake up to the freshest water every day, too! Enter below for your chance to win a ZeroWater Filter System! Posted on behalf of ZeroWater. Complimentary product received for review purposes. Opinions and comments on this blog are those of the author. I never actually thought about investing in a water filter system the smell of bleach in our tap water is just horrible,maybe this would help! We aren't too much of a fan of our tap water but would definitely use this instead of water bottles. We could stop buying bottled water and use this. Zerowater would bring healthy hydration and cool refreshment to our family - we drink a lot of tap water! I think Zero Water would allow us to cut down on buying bottled water which would save us money and reduce waste. Our tap water is safe to drink but I find it gets a smell at certain times of year which makes it taste a little off so I just buy bottled water instead of dealing with it. This would be great. Our water has a chlorine taste that my son hates. ZeroWater could bring fresh, cleaner (filtered) water to our family! Our tap water sometimes has a strange flavour so this would make it taste much better! It would keep us refreshed and remind me to drink more water! A ZeroWater would bring us a dryer fridge! We currently have an old competitor jug that leaks that we keep meaning to replace. It would provide fresh drinking water that's cool for both my family and my kitty! It could bring me better tasting water! Our water doesn`t taste the greatest here either,and myself and my son drink A LOT of it. I have never tried Zerowater before,would be nice to have another jug in the fridge! We use a lot of bottled water (because our tap water is not great) and I would like us not to use them anymore, so this would help us eliminate the use of bottled water. If I had a Zerowater Pitcher I could quit buying bottled water and my hubby would be happy. He complains about how heavy the flats of water are every time he brings it home. It would encourage my kids to drink more water and be healthier!!! Healthier lifestyle + peace of mind knowing we're drinking clean water! Where we live we have hard water and it would be nice to know that we are drinking a more safe water. zero water would encourage me to drink more water as I tend to be guilty of under consuming! This would be great. We drink a lot of water and our city water doesn't taste very good. It would bring cleaner water and less buying bottled water , Treen Goodwin rafflecopter name !!! ZeroWater could bring hydration to my family! I think we would drink more water if we had this. I would love to have clean water all the time. I hate using endless water bottles just to be sure I am safe from chemicals that can be dangerous. Fresh drinking water! Especially my son he’s crazy for water! ZeroWater Filter System would bring fresh, great tasting filtered water to our family & eliminate the need to purchase bottled water. It would cut down on our bottled water consumption, which is good for us and the environment. ZeroWater could bring my family fresh clean, tasteless water. This would be great to give our family clean water. Zero water would supply cleaner water to my family. ZeroWater would bring great tasting water into our home and will encourage us to drink more water! it would bring fresh amazing water! Zerowater could help us to drink water that is cleaner so that we can cut back on bottled water.